Recreational vs. Academy - Which to choose? Our Academy program is a year long program that is based on Long Term Player Development utilizing the US Soccer Federations player development curriculum and Best Practices. The Academy program is designed for players who desire advanced training from our clubs highest level coaches. 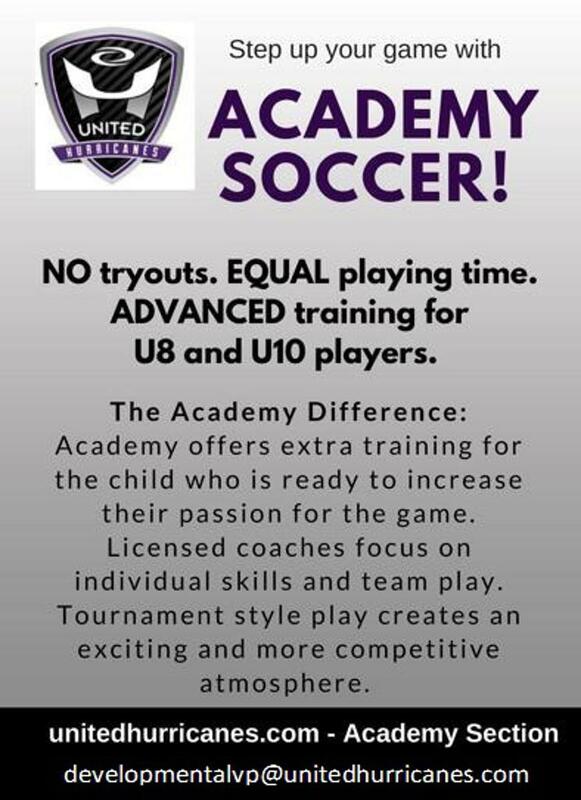 It offers an alternative development and playing opportunity geared toward talented U8 (6 -8 year olds) and U10 (9 and 10 year olds) players who are dedicated to soccer, and have a passion for the game which is "beyond traditional recreational." However, this program is not select soccer. There are NO TRYOUTS and all players will receive equal playing time. Academy style training for U6 boy and girl players (2014/2013 birth year). This program will involve fun and engaging drills and games focusing on touches on the ball: Dribbling, passing, trapping and shooting. Trainers will consist of academy coaches as well as high school players. The main goal is to provide a fun environment for kids to gain confidence in their skills as well as develop a love for the game. New uniforms for the 2018-2019 season. Academy uniform kits are at the bottom of the page. The League will be administered via the East Central District and will include clubs in the Green Bay and Fox Valley areas. Players will be assigned to teams prior to the League schedule. Please see the chart below to determine player's "soccer age" for the upcoming season. When you register your player, the registration system will automatically assign your child to the correct division based on the date of birth you enter or on the date of birth already in the system. IMPORTANT: For ease of registration set-up, players will register as U8 or U10 although we may, if league numbers allow, create a U9 division from the registered players. IMPORTANT: If you plan to apply for assistance please wait to register your child(ren) until you receive your determination notification. All registered players are covered under the Wisconsin Youth Soccer Associations General Liability Insurance policy. For more information or to file a claim please use this link. ©2019 United Hurricanes / SportsEngine. All Rights Reserved.